For a brief period, Ferdinand Graf Zeppelin's giant gas-filled airships ruled the world’s skies. Though conceived as passenger craft, during the First World War rigid and semi-rigid airships performed long-range scouting and bombing missions. Zeppelins includes die-cut-and-mounted playing pieces: special, oversized 2/3-inch by 1-and-1/3-inch beauties depicting famous airships of Germany, Great Britain, the United States, Italy, Austria-Hungary and France. 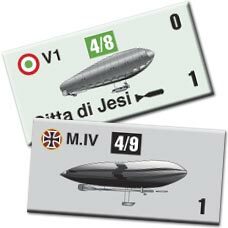 These are used with the new tactical and operational rules provided; unlike the standard game rules that treat all airships the same, with the Zeppelins module, each airship class has its own range and endurance qualities. Every airship that played an important role in the First World War is present, both German Navy and German Army machines that scouted for the High Seas Fleet and attacked naval targets. The ultra-long-range “Africa Ship” L59 is present, along with the big, modern L100 class cancelled by the war’s end. The Royal Navy maintained a large fleet of airships, and the British get the Italian-built semi-rigid airship SR-1 along with the many rigid airships built at war’s end. Italy built a large number of semi-rigid airships (with a solid keel rather than a complete frame as with a true zeppelin) and these are also included. The United States Navy gets its Shenandoah and Los Angeles, and the United States Army the big semi-rigid airship Roma. The French Dixmude, a former German zeppelin, is here as are Austria-Hungary’s small contingent. New airship-centered scenarios, or modifications of current scenarios, are included for almost all of the Great War at Sea games: Mediterranean, Jutland and U.S. Navy Plan Gold. 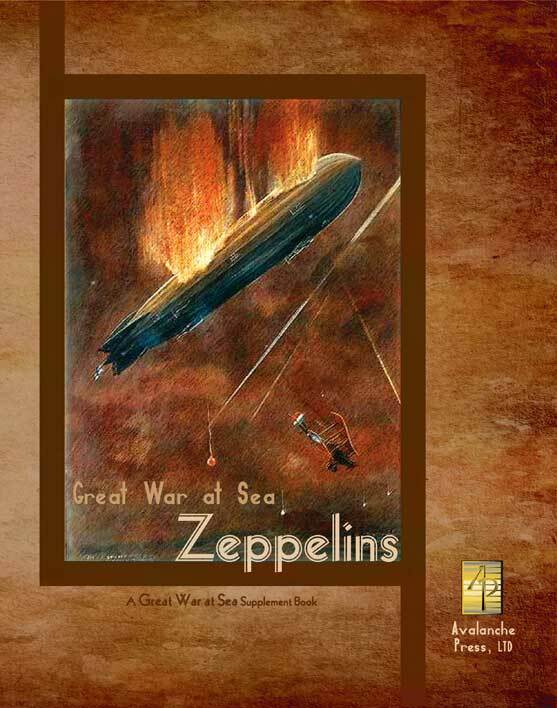 You can get more zeppelinocentric scenarios in Great War at Sea: Airships. Status: This item is no longer available.